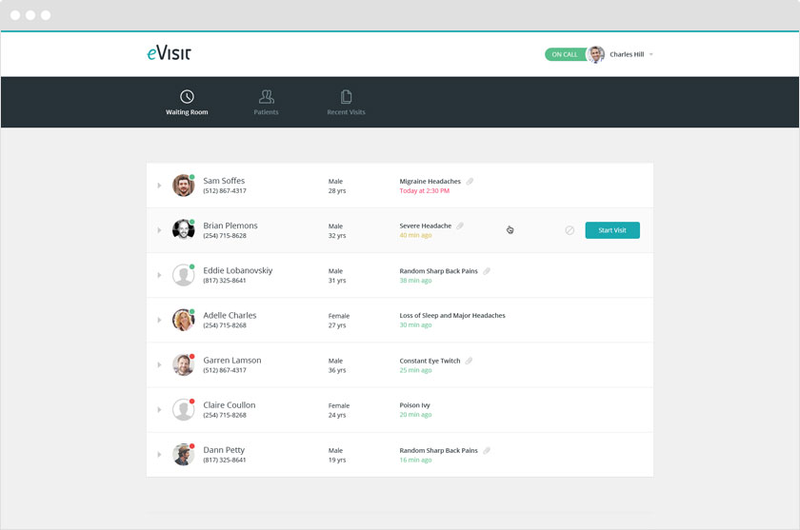 eVisit is a patient engagement telehealth software platform for healthcare providers. The software allows physicians to connect with and treat their patients remotely and facilitates reimbursement for telemedicine visits. eVisit is transforming the healthcare delivery model and disrupting the $135 billion dollar primary care delivery market by providing physicians a tool to recapture patient visits from urgent care and emergency room facilities. Pros: Being able to face time with patients far away, allowing them to pay online, allowing real time charting and use of pharmacies. The best part for me is the help from the support team. They are definitely limited in what they can do (we'll get to that later) but if they can do anything within their power to help me, they do. They are cheerful and willing and eager and just delightful, as a group. I've yet to meet one that I didn't like and appreciated greatly. Cons: I see patients on evisit, mostly to consult about and order a confirmatory lab test. They pay me for the test and the lab bills me directly for all the tests I order once a month - this specialty lab will not bill patients directly. Most patients order the test and pay for it along with their consult at the time of our visit. But some people want some time to think about it (the test is expensive) or they don't have the money right then or room on their credit card. So they call back later and want to add the test. Some people get an indeterminate on their first test and need to restest three months later. But in order to do that, they have to set up another visit with me - a whole different visit! It usually lasts about 1 minute do we can do the charge but we still have to find a time that's agreeable, take the time of our days, etc. It's a huge hassle. And their rationale? There is a risk for fraud. Excuse me? Fraud? I am charging their credit card for heaven's sake, they would probably notice a $250 charge on their card and ask about it right? And it's also incredibly insulting that I would commit fraud with a patient (I get that it happens but not in this situation). It's just ridiculous but after years of me doing this with them, they still won't change it! They won't even allow a patient to call in to eVisit and ask for the charge to be made, even if they can identify themselves. It's rigid and highly annoying. Overall: Not enough room above. I also have asked for small things that would make my life easier, like including their email address in the chart note area with their name and phone - they won't do it. There is so much good about eVisit but some rigidity that doesn't make sense. I've fantasized about setting up a similar thing just for me with some programmer but I know it would be very expensive so for now, eVisit it is. Pros: eVisit has great customer support for both me as a provider and for my patients. The interface is user friendly and intuitive. They are constantly updating their product and adding new features. Cons: Not much to dislike here. As with any IT platform like this, I just want it to work perfectly every time. Overall: I started a telemedicine/virtual urgent care company last year and literally spoke with and demo'd at least 8 different companies before deciding to work with eVisit. I continue to be very happy with my decision. 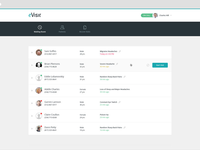 While most of these competing companies offer the essentials like HIPAA compliance, encrypted video, and ePrescribe, I have found the biggest difference with eVisit on the back end. Let's face it, it's still new technology and there are going to be IT problems. Some patients and even some providers are going to run into conflicts now and then. I certainly have. The difference with eVisit is when I do have an issue and call for support a human answers the phone. Not only that, it's a knowledgeable person that has been able to solve the problem real time and on the rare occasion that they couldn't, they put a ticket in that was vigorously addressed the very next day. My patient's have had the same experience when they have had the need to call and have been personally walked thru the enrollment/set up process. This has been a huge difference maker in my practice and definitely where you get great value for your money. Recommendations to other buyers: I think eVisit is worth a very serious look. While their product is great it's the people behind it that make the difference. You can talk with them, troubleshoot, and make suggestions that are actively responded to. Pros: There wasn't much to like. The software had many flaws. Lag in video and sound together. Sound would cut out and or then video would cut out or freeze. Made it very difficult to provide services to patients. Cons: There are so many cons to this app. First and foremost is the quality. Everything ran very slow. The video and sound would cut out all the time during each session. Nothing the provider nor the customer would do would help to restore it to better settings. When contacting support for the issue they would be very hard to reach and or had trouble figuring it out on their end. So then they would turn around and blame the provider and patients internet service or LTE connection. The majority of the time patients had to be rescheduled or called by phone and we were then unable to charge for the visit. Overall: There are NO benefits for our business using eVisit. They are incapable of solving their own technical issues so they blame the clients and their patients. When giving notice to end our contract they still chose to charge our business, even after agreeing and providing written proof that they would not. eVisit was not capable of caring for their clients needs and would prefer to push blame back on them to make a profit. Numerous times we reached out for not only technical support but to customer support and towards the end found out that our assigned eVisit personal was no longer employed but we were never notified of this. eVisit signed our contract and then chose to ignore us when we needed help. Because of so many different dysfunctional situations in their cooperate office and inability to provide the services of our contract, we chose to look for a new platform that functions and provides services as they say they would. Pros: Providers can connect anywhere and so can patients. In a society always on the move, eVisit can fit into our patients lifestyles making patient care and medication monitoring easy and painless. Cons: Due to connectivity issues there are days that you cannot connect or calls are dropped. We have always wanted to be able to charge patient prior to the appointment like we do in office. We would also like a way to print a simple one page receipt. Overall: Offering eVisit to our patients who live farther away or who have trouble getting out of the house has enabled us to not only keep the patients but enables us to monitor them and keep them healthy. Pros: This product is very each to use and set up. Patients find it very easy to use as well. Customer Service is very good. Cons: There really isn't anything I don't like. Sometimes the system freezes but that is rare and most likely unrelated to eVisit themselves. Thank you so much for your kind review! We work hard to make sure that you and your patients are taken care of. Please keep in touch any time that you need assistance. Pros: Ease of use. Easy to learn and utilize when working correctly. Good customer support so far with only a few hiccups. Cons: Sometimes patients can not hear us. I don't know if this is due to software malfunction or user error on the patient's part. Thank you for your thoughtful review! We are so thrilled to hear that you find our product easy to use. That in mind, we understand how frustrating it can be when you are not able to complete the basic functions to care for your patients. We are devoted to our customers' success, and would love to hear from you when you are experiencing these issues. We are happy to troubleshoot with you and with your patients to ensure you can offer that top notch care that your practice is known for! Please feel free to give us call and we would be happy to help! Thank you for taking the time to share your opinion with us! We work hard to make sure that you, and your patients are able to give (and get!) care when, and where it's needed. We would love to be compatible with other browsers, but at this time, they do not meet our security standards. Hopefully soon, we will be able to continue to offer the same level of convenience across all browsers! We appreciate your feedback, and are always happy to hear from you. Pros: eVisit is user friendly and requires very little maintenance. 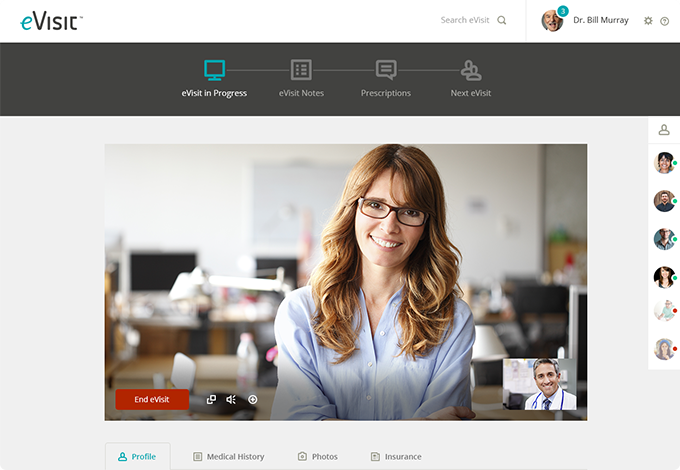 The customization of eVisit was also a great selling point in the selection of a telehealth platform as well as its interfacing abilities. Cons: It would be beneficial to have a "password" protection on the software to prevent anyone from downloading the product to have access to our providers. We have had a few people from various states across the country registering and attempting to contact our providers. Overall: We utilize eVisit for employee health - where most companies will use the platform as a revenue generating source we are using the platform for a cost savings program. Pros: I'm very confident telling my patients that our office visit is HIPAA compliant and secure. Most of them have no trouble at all figuring out how to log in and use the platform. It's user friendly. I like that scheduling and billing is built in, and that patients can schedule themselves. I can also send treatment sheets, e-prescriptions, and attach other handouts as needed. Cons: This is not a charting EMR. While it covers basic notes and you're able to create templates, I'm still looking to acquire another EMR (which means operating another computer during visits and having another patient portal for them to log into). There a few features that would be helpful; e.g. being able to schedule a patient myself, charge repeating fees and no-show fees (you can only charge them if THEY enter the visit). Seems to be some glitches with time zones. Overall: Being able to see patients from any location with wifi has added flexibility to my growing practice. Pros: The biggest advantage to this solution is that it combines audiovisual interface, charting system and credit card processing in one package. It is, in many ways, a turnkey solution for this kind of practice. Cons: The ability to add to the information provided by a patient is somewhat limited. However, I was told by customer service representative that this functionality will be expanded in the future. Overall: There is a definite advantage to using this software platform in that it combines almost all functions needed to run a telemedicine practice, and pricing is competitive. Pros: Ease of use and compatibility with various devices. Also, I like the fact that you can save and pint your notes for placement into the patient's chart. being able to type a Chat in the lower right corner is a cool feature too. It allows you to communicate with the patients that there are issues with volume or microphone for example. Cons: If I call customer support, I often get someone who just impersonally takes down my number and records the problem - I do not get a feedback. However, in all fairness to the original eVisit folks who designed the platform - they were awesome and several of them were helping me out via their professional direct emails with my issues in the beginning and as Inwas getting started. Pros: The eVisit platform is so easy to use and is very reliable. There is always piece of mind know that I really never worry about it. It just works. My patients always have an easy time accessing eVisit as well. Overall eVisit is fantastic. Cons: I can't think of anything negative about the software at this time. Overall: I love working with the eVisit team. They really take time to learn what needs I have for my clinical applications. They respond quickly to any questions I have. And they are just really fun to work with too. Thank you so much for your kind review! We are so happy to hear that you like to work with us, and the technology. Please do continue to reach out to us any time that you need assistance. We are always happy to work with you! Excellent. More words so that this will go thru. Pros: It does the job I want it to do. More words so that this will go thru. Every good boy does fine. Girls and boys do good together. Cons: The occasional bugs. More words so that this will go thru. Every good boy does fine. Girls and boys do good together. Overall: The theoretical ability to eliminate both physical offices and practice medicine from home. Pros: I like the fact that the bare bone EHR is connected to the telehealth program. It is fairly simple to navigate by the provider and the patient. Customer service is fairly responsive, but can take time to get someone who can address the issue. Cons: It is very expensive. For new business, there should be a way to offer a pay per visit while to business is growing. IT/tech support is not available 24/7. For a company that is open 24 hours a day 7 days a week, it is not good when a technical issue arises during a time when IT is not open. Pros: Nothing - the website before purchase seems to have good information about telemedicine, so I expected it to be a much more high quality software. Cons: Poor function - poor connectivity - missing minor features - silly errors like patients given the wrong date and time for appointment reminders - cannot access prior prescriptions - cannot access patient info from my phone. Terrible all around. Overall: I have been trying for months to get this system to work but have continual problems with basic features. It is not intuitive, requires involvement with support to make any changes, they make stupid errors like giving out my personal phone number to patients, connectivity is always a problem, and it misses primary needs like being able to find a patient phone number from the app. Ridiculous. I would NOT choose EVISIT.com for your telemedicine platform. Dr. Murphy, as a company we welcome all feedback and see it as a gift. Thank you for taking the time to reach out to us, we are taking your feedback to heart and it has been shared with all of our department leaders. While your experience with our product is unfortunate it does not represent the experience reported to us by other physicians and practices. I understand that you have been working with our Customer Success team on some of these challenges, they will continue to help resolve these issues to your satisfaction. In addition, I have also left you a voicemail and would love to speak with you personally about your concerns, please call me at your convenience. As a company we are committed to simplifying healthcare, it is disappointing that this has not been your experience to date. We will continue to be committed to you and your practice to make this a reality. I look forward to talking with you soon. Pros: Easy to use from the provider end. Let's me see patients around the nation without leaving my office. Pros: How patient friendly it is and useful the software is quite self explanatory you create an account then see the doctor . Cons: here's no denying that telemedicine is going to be an integral part of the future of healthcare in this country. 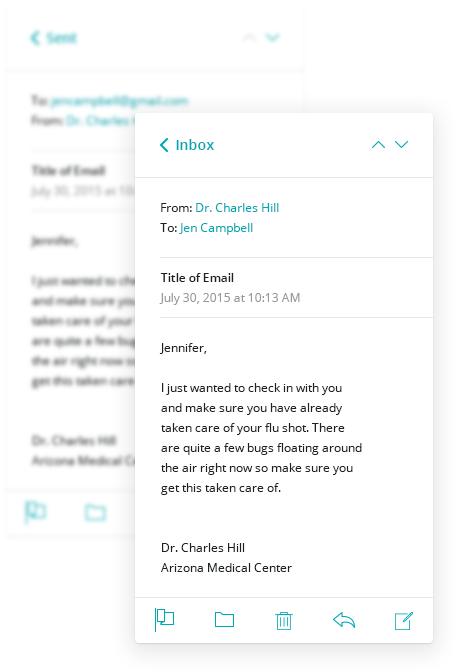 Working in medicine nowadays, the ability to provide secure, reliable visits to patients remotely is critical. The hours I spent researching various methods, technologies, and full service companies all felt worth it when I discovered eVisit and their incredible team. From that first conversation and in every call, text, email, and video chat since, I've felt like every member of the eVisit team truly cared about my practice and my patients. They have worked closely with me along the way to ensure my launch was successful and that I'm continuing to drive more utilization with my clientel to meet the goals I had with respect to telemedicine. 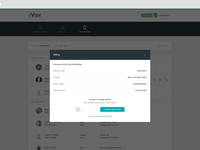 After being with the company for several months now, I'm still continually impressed by how user friendly eVisit is. If there is ever an issue that pops up, they are eager to help our patients out. Further, they have not only asked, but are actually interested in hearing my feedback about product improvements. I'm so glad I found eVisit when I did and know I made the right choice to work with such a fabulous company! Comments: eVisit customer service and IT support are great. I appreciate how responsive and quick they are at answering my questions and ensuring our success with their platform. 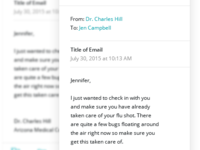 Integration with my practice's EMR was seamless, which was one of our big concerns. Very easy for the patient to see availability and to schedule an appointment. My patients' feedback has been very positive as well. Even patients who are far from "tech savvy" have told me they were able to have someone from eVisit support guide them thru the set-up process. Only occasional hiccups have been on the patients' end (i.e. not having internet connection or camera etc.). I have not encountered any problems with sending prescriptions or tailoring my calendar/availability. I was once apprehensive and even a little skeptical when I was asked to research telemedicine options by my employers for a large dermatology practice but eVisit has made the integration simple. Friendly staff, overall great platform on desktop and mobile. Pros: eVisit is easy to use. Great scheduling feature. Seems to be easy for patients to set up and use. Comprehensive user interface. Cons: Difficulty setting up new providers/onboarding is slow. Needs to have more options than just "Deny" as a response to a text notifying of a patient requesting an eVisit. Should have the ability to make a call to the patient directly from the text message in order to be able to communicate to the patient that you are not immediately available, but can connect with them at "such-and-such" time. Pros: Basically does what it says it will do, remotely connect patient and doctor in a virtual doctors appointment. Cons: Not always smooth connection and can be glitchy. Scheduling and appointment notifications are clumsy and cumbersome. Software not always intuitive for the user. Overall: Basically satisfied, but took a while to work out the kinks to make it functional. Pros: This program is HIPPA compliant, and evisit has friendly and quick customer support for any issues that arise. Thank you so much for your thoughtful review. I am sorry to hear that you are disappointed in the mobile app. We have made a lot of really wonderful improvements recently, and hope that you have been able to benefit from those. Please feel free to reach out to your Customer Success Team for more information. We're always happy to help. We have been subscribed to e-visit for a year . The initial set up for this software easy. Pros: This software was very easy to use and the initial set up was pretty straight forward. We mainly used this software for our legal cases. Cons: Cancelling and doing a billing freeze for this software was a bit tedious . And the account manager that we originally worked with no longer worked there and no one contacted us to let us know that we would be assigned someone new. Compared to other telehealth software companies they were a lot pricier. Pros: Nothing. The plattform and company are unprofessional. Sounds good when they pitch it to you and use their marketing skills, but that is about all. Cons: The plattform does NOT work, image is always pixelated, image freezes, sound and calls drop. No it is not my equipment or the computers or phones of every patient. Cons: No EPCS feature. Does not have EMR feature. Cannot bill for "no-show" patients. Expensive for limited features. Pros: You can use it from your smartphone or laptop from the comfort of your home or office! Pros: The interface is pleasant to look at. The actual visit is nice and seems to work well. Cons: My patients have had issues signing on and they seem to have to go through a history screen in order to log in for their visit and to reschedule there seem to be some issues. Not quite seamless yet but its early days. Pros: Having the custom branded app has really helped our company utilize telemedicine/virtual visits. Cons: The starting process of getting our app built took far too long than it should have and we had many hiccups along the way. Overall: Now that we have it and it is working our patients love being able to do virtual visits more easily. Overall: Great customer service and growing with our company as we provide care in a new platform. This is an exciting time for medicine and treating patients in a new way. We are happy to have evisit as our team member. Pros: This software was very ease to use for our clinic, the clarity and the connection between provider and the patient made it very easy. Cons: Customer support wasn't that great it took forever to get in contact with our account manager. Also, it is much pricier than most telehealth companies. Horrible support, customer service and only connects to patient 33% of the time. Comments: Don't waste your money, is one of the cheaper platforms but not worth the headaches it gives the providers and patients. Pros: Initial information obtained from patients is very detailed and gives the option to remove payment. Cons: Video will only connect about 33% of the time or less, support never helps resolve any issues consistently says it is an internet issue. Worked with account manager to resolve issues and he provided horrible customer service, didn't respond to emails or help get issues resolved. 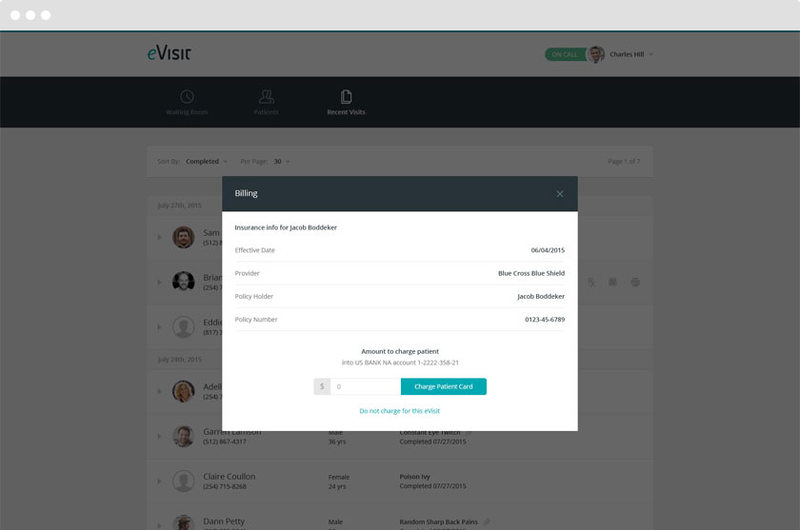 Pros: Our clinic director uses eVisit occasionally for our off-site patients. It works really well and the patients love it for consultations and re-evaluations! Cons: Sometimes glitchy with audio/visual, but thats common among webcam softwares. Is there a way to download videos? When it works its great to use...when it works. Pros: It's pretty easy to use. The visual setup is pleasing to the eye and makes it easy to navigate. However to cons are enough to make me reconsider my subscription. Cons: The system glitches where the screen freeze. My clients only seem to be able to access the system 50% of the time. The cost for what I'm getting. Pros: The customer service department is very friendly and helpful. I also like how easy it is to create a schedule for appointments. Cons: Sometimes patients can hear me or see me or vice versus and I don't know how to help them. I usually have to end up calling them. Thank you for taking the time to let us know how eVisit has worked for you. We love to work with you! We know it can be frustrating when your patients are having trouble seeing or hearing you and we want to help! Please do not hesitate to give our Technical Solutions Team a call when these issues arise, and we'd be happy to troubleshoot with you.